It is with great reluctance that I recommend a long position this weekend. I have a chart list with about 800 of the most tradable stocks in the market. Only 42 posted a gain on Friday, which is not a big surprise. However, only about 20 of the 800 stocks had charts that I would even remotely consider buying. There are two things you can look at after a big market drop. The first is, "which stocks did not drop" and the second is "which declines are worthwhile to buy." Sometimes a big decline is just a prelude to a bigger decline. Buying a one day dip will make you feel like a hero if the market reverses like it did on Thursday. Buying a dip that keeps falling will make you kick yourself for not waiting for a rebound. 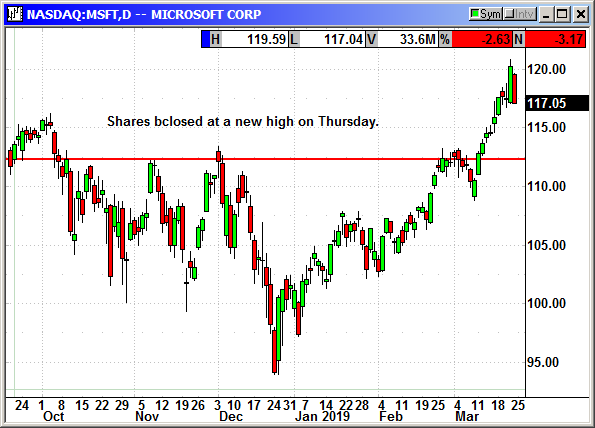 I did not want to recommend anything but I chose Microsoft because the trend is strong and the dip gave us a buying opportunity. Options are cheap so the risk is minimal. Buy May $120 call, currently $2.95, stop loss $112.85.